Wow. We did it. Ten performances, something like 450 people in attendance, amazing reviews, enthusiastic audiences and a very happy director. What a show, what a run, what a great time. But we didn't do it alone. I want to say thank you again to everyone who helped us along the way. I will probably miss someone, though I hope I don't. So, John and I did Copenhagen last year. It was really a great success that far exceeded our expectations. We really were just hoping to break even, and maybe entertain a few people, but we had large and enthusiastic crowds the whole way. 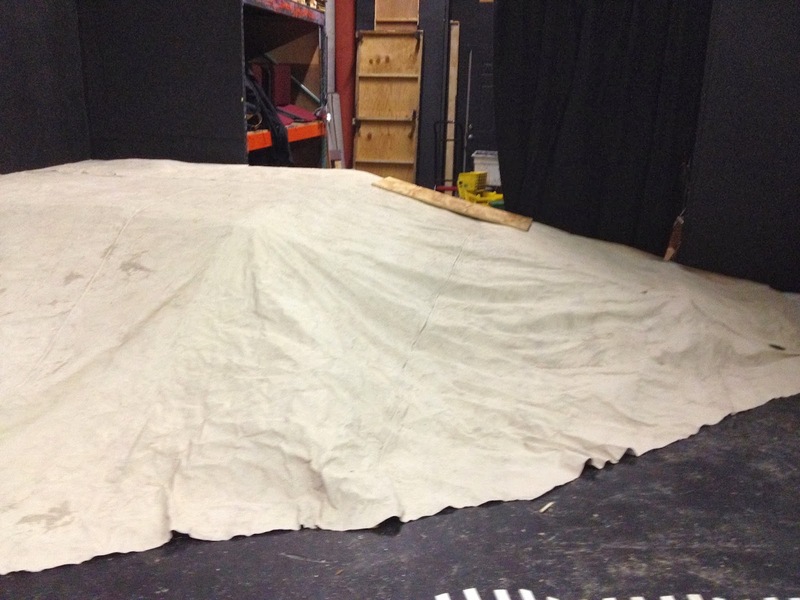 It was a lot of work too, but a few months after we closed, we started kicking around plays for our second show. We read a number of scripts, and we eventually settled on Seascape. It was a play I loved and I knew would be perfect for John, and John liked it too. The problem was, it was a much bigger undertaking. The set was going to be more than 3 chairs. And the costumes... yes the costumes. We absolutely could not have done it without the help of many people. Thanks to John McIlwee (the last person to direct Seascape in the area) for the encouragement and the perspective. Thanks to my parents for the encouragement (as always) and for bringing driftwood in the car all the way from Florida for me. Thanks to the design team. Todd Houseknecht - Set and Lights, the hardest working man in local show-business. Todd came up with the plan for that great dune, and his garage still has the paint spot from painting the canvas to prove it. Todd worked all day for two days with me to put that thing together. 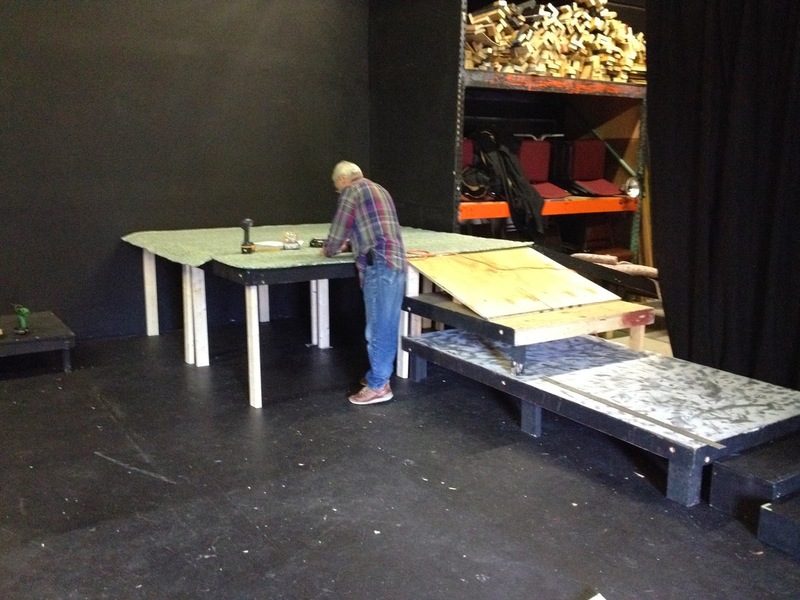 His effort and dedication (and tools) helped make that set happen. Shannon Clark - Costumes - I mean, really. Those costumes were amazing. I knew going in I needed GOOD lizard costumes, and boy did he deliver. I actually asked Shannon for a recommendation on the assumption I couldn't afford him. When he said he was interested I jumped at it. Will Mikes - Sound - Sound was a much bigger element of the show this year. Those ocean sounds under the entire show were great, and the airplane effects had to be good. They were. A critical and under appreciated aspect of theatre. Thanks to our friends that provided rehearsal space. Tina Vance and Hope Community Church - Thank you for helping us again this year. They're rapidly becoming major patrons of local theatre. Kevin Ferguson and Cardinal Gibbons High School - Thanks to you too. Being able to use your theatre space while school was out was a great help. Let me tell you that if I had to pay even $10/hr for rehearsal space, this show would not have made money. Rehearsal space is a HUGE contribution. Daniel McCord, who designed another amazing poster. Having a key art/image/font is SO important to start creating messaging. From the first facebook post and blog post to the last poster we printed, the same "look" tied everything together. Jason Bailey for shooting our kickstarter video, and Patrick Campbell for editing it AND for shooting those promotional pictures. If you saw a review of our show with a picture, it was taken by Patrick. Speaking of Kickstarter, thank you to all our backers! The kickstarter raised enough money to cover the costumes and set, wow! Thanks to our stage management team. Kieth Bugner, our fill-in stage manager who stepped in for a rehearsal incredibly seamlessly. Our ASM/Lizard Wrangler Michelle for stepping in and helping with make-up and props for the show. That lizard makeup you saw was really a collaboration between Michelle, Sam, and Shannon. Our amazing Stage Manager Andy Hayworth. Last year he was our director and did a great job, so he got a promotion. Heh. Seriously, the stage manager does twice the work and gets half the credit compared to the director. Having a good SM is key to a good production, and Andy is a damn good SM. And thank you to an amazing cast. Thank you for sharing your gifts with me and with our audience. Each of your performances was just fantastic. I loved working with such a talented cast. It really made my job easy. Thanks for making me look good. Ryan was so amazingly solid throughout the rehearsal process, and that lizard walk, the staunch physical presence was believable and intimidating. Samantha brought a great physicality, and such an aware emotional presence to Sarah. She was always so very present, thinking, reacting, I learned so much from you. Julie, wow, really, again what can I say? She drove the first act with her energy, but also her emotional range in a way that I found gripping and funny night after night. And John... he gave a great performance as always, the love and warmth he brought to Charlie made his longing and eventual change make sense. It hit home every night. But more than that - my partner in production, I couldn't and wouldn't have done it without you. WE DID IT AGAIN! It feels great John. Thanks. And finally, thanks to you. We do this, rehearse and rehearse, create stories and hone them until they're real, to SHARE them. Without you, without having someone to share these stories with, it isn't theatre. So thank you for bringing these stories to life with us. It's been a great journey. To everyone who helped make it happen - thank you! We're off to other things. John will be appearing in Wit with Justice Theatre Project. Ryan will be in Arcadia at Deep Dish. Samantha is teaching trapeze at Cirque de Vol. And Julie is spending some quality time with her couch and the Jay Hawks. Me, I'm off to New York for some auditions. But I'm planning to spend some extra time being thankful for all these people, and for the many blessings in my life, something I probably don't do enough. Thank you. We are sorry to announce that one of our cast members was hurt and cannot perform this afternoon (January 19). Since it is the last show, we will still perform, and I will read in the lines. That's the bad news. The good news is, we are not going to charge for the show. So if you want to come and see what we got for FREE this afternoon, come on down. If you bought tickets ahead of time on Brown Paper Tickets, we will cancel the transaction. I will not be accepting money at the door, though we may take donations after. Think of it as a high production staged reading. If you'd rather watch football, hey, that's ok too. We apologize, but sometimes this stuff happens. I swear it has nothing to do with the show. This isn't Spiderman I promise. It's the last weekend to see Edward Albee's Seascape! Only four more chances to see a show that critics agree is one of the best in 2014 (so far). ... or check out the links on this website. Seascape - read the reviews, see the show! Seascape is getting great reviews! Read the whole article at each link! In CVNC, Alan R. Hall says: "[A] funny and beautiful work that expresses tremendously well what Albee is trying to say, which is, change is the only thing that we know will come about, and it will come about whether or not we are prepared for it." Roy Dicks in the News & Observer finds "knee-slapping humor and forehead-smacking insight, both signaling that we should never stop seeking to understand and experience our world." In Triangle Arts & Entertainment, Martha Keravouri and Chuck Galle say "set and lighting designer Todd Houseknecht and costume designer Shannon Clark, have done an outstanding job"
"[Julie Oliver] goes to town with it, delivering Albee-esque bombshells with utter cool. ★★★★" according to Kate Dobbs Ariail in the Indy. 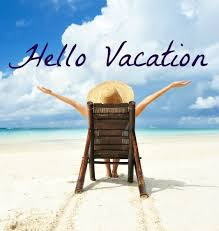 If you can't come this weekend, we run Thursday-Sunday the next week too (Jan. 16-19). Wow, what a great opening weekend. We had to cut it short due to an illness, which is too bad, but we still have two more weekends, Jan 9-12, and 16-19! 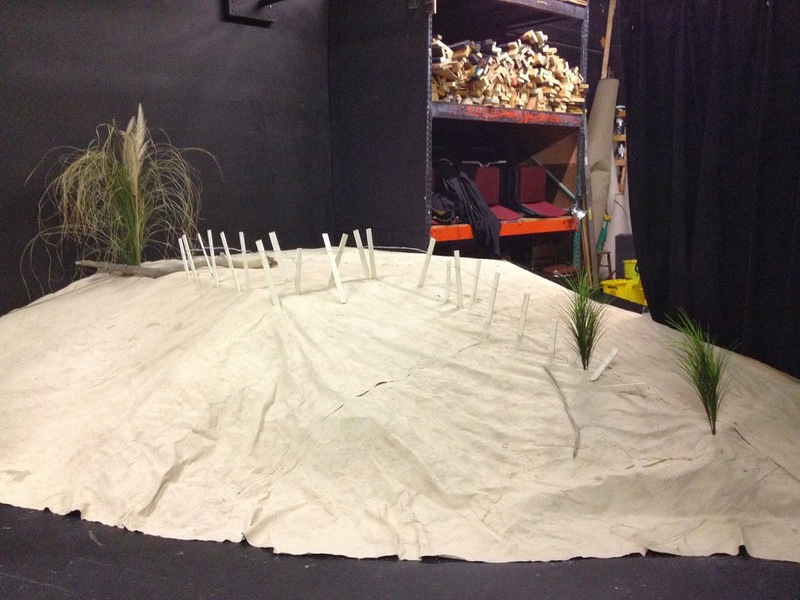 We had a number of comments about the set, so I thought I'd put up a little picture post explaining the construction. Todd's plan started with a series of platforms. These platforms formed the "practical" part of the dune, the parts actors could actually walk on. As you can see, there are two large platforms in the back, and a series of lower platforms forming a ramp going down along the up stage side of the dune. You can see the first transition ramp as well right nest to John. You can also see the first layer of carpet foam on the top platform. We used several layers of carpet padding, plus some actual carpet (part of my house had just been recarpeted, so we used the old carpet that had been ripped out). Once we had constructed the ramp and platforms we strung chicken wire along the sides of the dune. We also put extra 2x4s and constructed a few wooden posts (you can see one in the center of this image) to give the dune some shape. 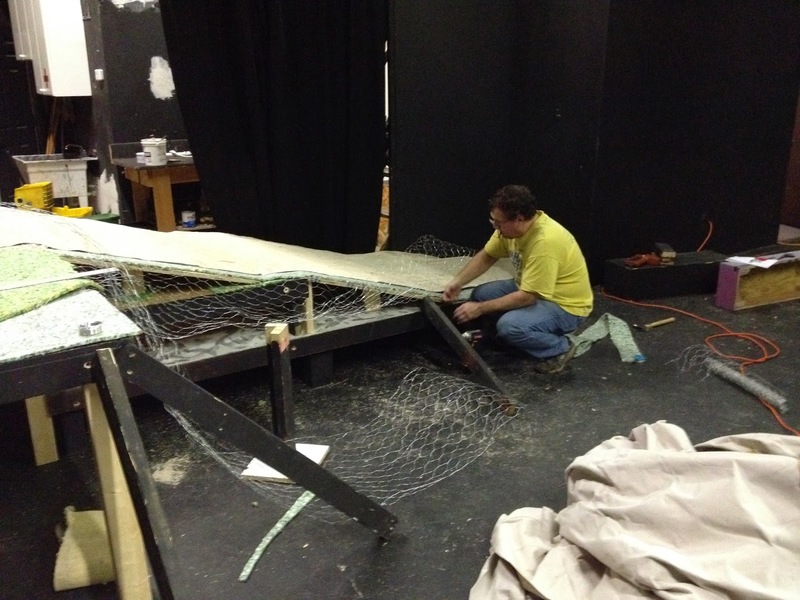 Here Todd is attaching the Chicken wire. you can also see the ramp has been carpeted. Once the chicken wire and wood frame was in place, we draped it with a large canvas. Todd seemed several large canvas pieces together with carpet glue strips, then he pre-painted it with a mixture of sand and paint to give it a textured look. We draped this over the frame and we cut off the excess canvas (we used strips of this canvas to help form the rock we made). After that was done, we dressed it up with some extra stuff: a few plants (small plants are from Michael's, the big one is just some pampas grass in pvc pipes attached to the platform) and a fence. The fence we got at Lowes I think, we pulled out some of the pickets and broke some off to make it look worn. Then I cut slits in the canvas and stuck them through at varying angles and Todd screwed them into the platforms from below. After that we poured some sand over it to give it a bit of texture and added some seashells. Tada! Dune accomplished. We regret to inform you that the show on Sunday, January 5 has been cancelled due to cast member illness. If you have made plans to attend, we hope you can reschedule to one of our eight other shows, Jan 9-12, and 16-19. If you cannot and you have already purchased tickets, we will be happy to refund your money. We hate to cancel a show, but sometimes things happen that are beyond anyone's control. Thank you to our amazing audiences Friday and Saturday night. We'll see you next Thursday!